As I write this post the S&P 500 is priced at 1,310. By my calculations I have current earnings at $91.4 for an S&P 500 P/E Ratio of 14.3. The earnings I use are as Reported Earnings, as opposed to the much more ambitious Operating Earnings, as I believe these are a much more appropriate (and conservative) measure. As a quick reminder Reported Earnings will typically always be lower than Operating Earnings as they include the cost of non-recurring items such litigation charges, costs of shutting a factory and good will write downs to name but three. Now it’s only my humble opinion, but I believe these are real and true costs incurred by the business, even if they are non-recurring and so badly want to be excluded by the “Company Bean Counters”. I then extrapolate these figures to cover a year to the end of May 2012. Now a lot of people will use the P/E ratio to make investment decisions. I choose not to and the reason for this is the business cycle seen by a lot if not all companies. Some would even call it boom and bust. 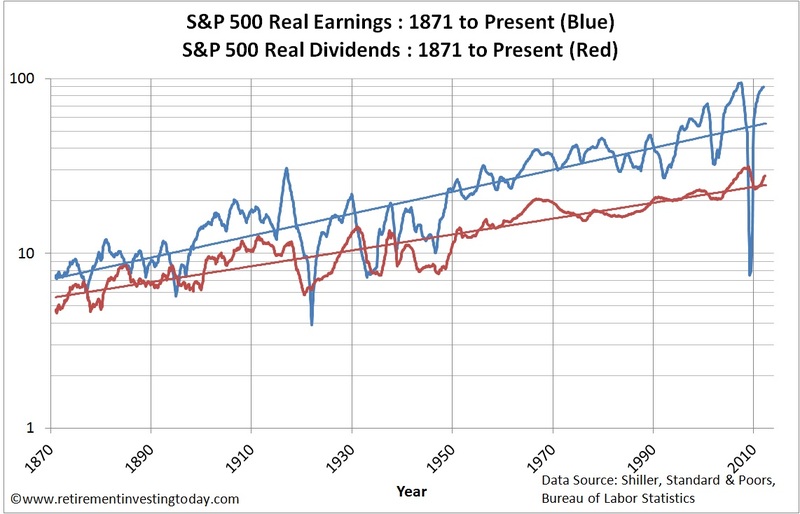 It’s clearly evident in my second chart today which shows the Real (inflation adjusted) Earnings and Dividends for the S&P 500 (or its predecessor) since 1871. Just have a look at how wild the swings in Earnings can be. 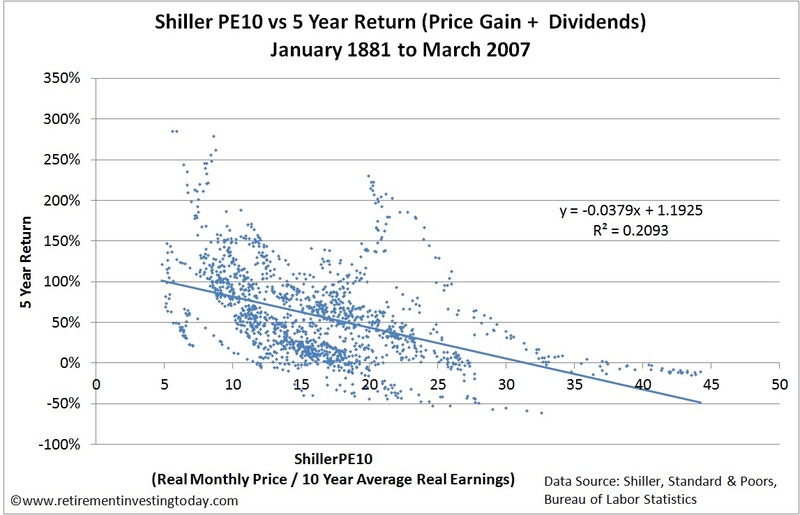 To try and smooth some of these swings and get a truer picture of a company’s Earnings I personally use what I have called the Shiller PE10 which is shown in my first chart (effectively an S&P 500 cyclically adjusted PE or CAPE for short). This method is used and was made famous by Professor Robert Shiller. It is simply the ratio of Real (ie after inflation) S&P 500 Monthly Prices to 10 Year Real (ie after inflation) Average Earnings. It is important to highlight that my calculation method varies from that of Professor Shiller. 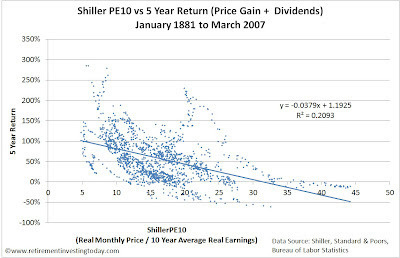 He only uses S&P 500 Actual Earnings data meaning the PE10 shown on his website only uses Earnings to the end of December 2011. As I use the S&P 500 PE10 to actually make investment decisions from I therefore use extrapolated Earnings estimates right up to the present day. S&P 500 PE 10 = 20.2. Dataset Average PE10 = 16.4. 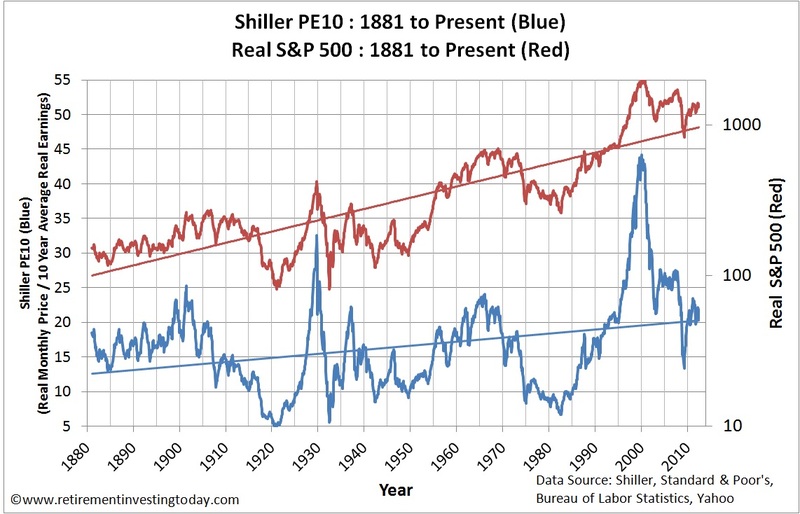 Assuming this is “fair value” it indicates that the S&P500 is still some 23% overvalued even after all the pain that has been felt over recent years. I would actually argue this pain goes back to 2000 but more of that in a post that I will make in the near future. Dataset Median PE = 15.8. Dataset 20th Percentile = 11.0. Dataset 80th Percentile = 20.9. 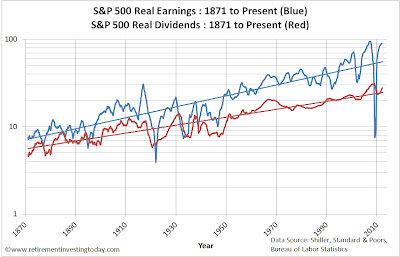 As mentioned previously my second chart plots Real (after inflation) Earnings and Real Dividends for the S&P 500. Earnings continue to grow with estimated earnings at $91.4. 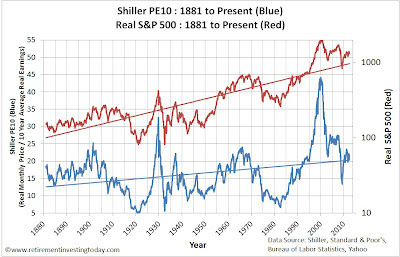 My third chart today highlights why I use the Shiller PE10 to drive a tactical portion of my Retirement Investing Today asset allocation which is nominal a strategic asset allocation. This shows a chart of the S&P 500 vs the Nominal 5 Year Total Return from January 1881 through to March 2007. The correlation is -0.46 with an R^2 of 0.21. This implies that there is a partial correlation between the S&P 500 PE10 and future returns from the market. With the PE10 at 20.2 the trendline implies a future Nominal 5 Year Total Return of 43%. In contrast the Real (inflation adjusted) 5 Year Total Return (not shown in any chart today) trendline implies a return of 28%. Prices are month averages except May ‘12 which is a 31 May ’12 S&P 500 mid market price. January ’12 to May ’12 reported earnings are estimates from Standard & Poor’s. Inflation data from the Bureau of Labor Statistics. April and May ‘12 inflation is extrapolated. Hi, good to see you back! Why do you think the long term CAPE is rising? Or, to put it another way, is the last 15 years (dot-com bubble) a blip we still have to work through? When you say rising I'm assuming you mean over the long term, ie 10's of years not 10's of months? I'm not so sure it is. I could be proven wrong but I'm always conscious of the phrase the market can remain irrational longer than you can remain solvent. As for why it's high today? I honestly don't know. If I did I suspect I could be a very rich man. One hypothesis though is that it could be to do with age demographics. I have no data on this so it's purely anecdotal. 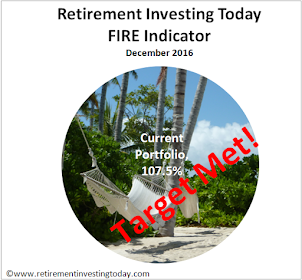 We have the baby boomer generation now having passed through a retirement saving period which will soon start to enter a draw down phase. 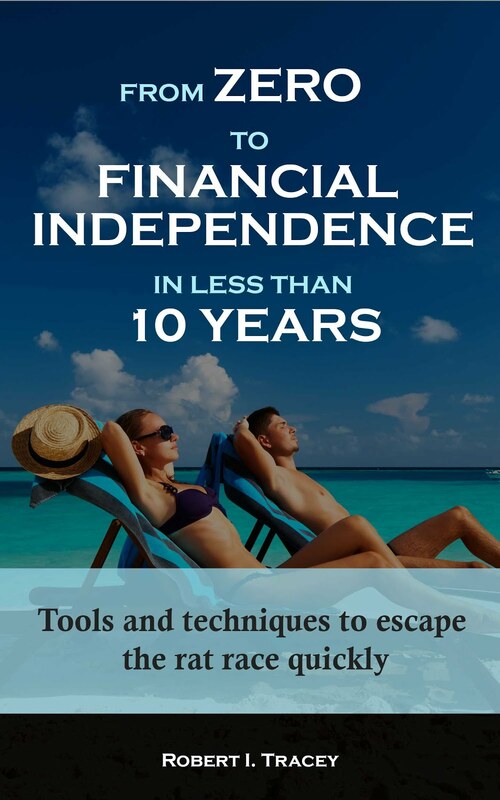 If that was it, then we have a very large number of people within the developed world who having saved for retirement, using various methods including shares (and property and bonds and ...), have provided a very large demand side. It then gets interesting from here on in. If my hypothesis is correct over the next 10 years we will see those providing the demand side move to the side of supply. Who will take up the demand? If there is nobody then we could see CAPE revert.